As it is today, I still shoot more than 90% film and the rest are digital. Maybe I like the grain and the smelly plastic too much to let it go. You can see more than 1400 images of my crappy film shots HERE. 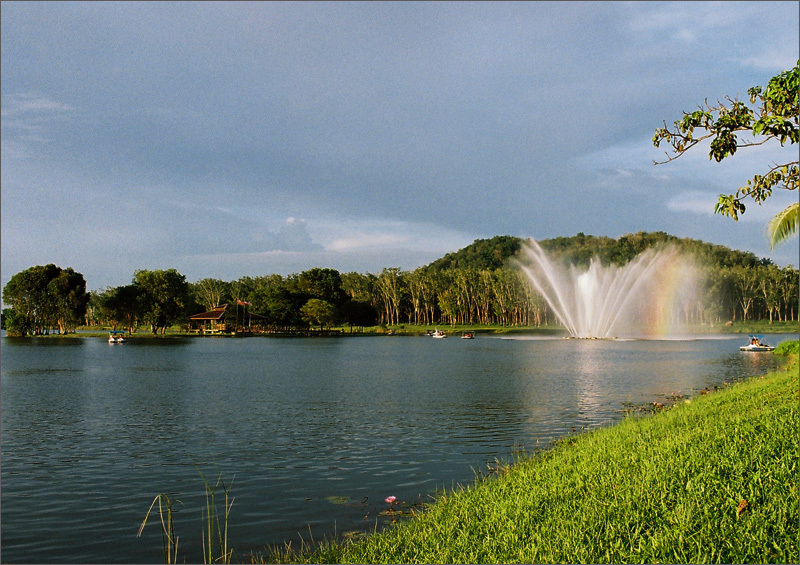 The rainbow appeared due to the evening light and the spray from the fountain at this Darulaman Lake near my house. Thanks Odile for the reminder of 300th post. Great taken, very good POV (beautiful green diagonal in FP). Ce n'est pas un feu d'artifice qui f�te ta 300�me image mais un joli arc-en-ciel sur ce joli jeu aquatique!!! F�licitation pour cet �v�nement et continues sur cette voie!!! A very sharp landscape shot with perfect timing. You managed to produce such a rainbow effect to this dancing water! A very peaceful ambient adorned with perfect lighting. A pleasant composition - postcard quality! A lovely shot of this tiny rainbow shot with beauitful lighting condition and vivid colors,a beautiful POV and a lovely presentation of film and its good example for our fellow photographer mark25 who uses medium format. Congratulations on your 300 posts so far good work, continue to delight us with your beautiful images. good composition and colors all in magical freshness. Congratulations on your 300th post. You captured a pleasant scene with excellent light and nice effetcs. Well composed with the green lawn forming a diagonal. Congradulations for your 300 posts,!! well presented and composed picture.. Although with awful delay, but congratulations for your 300th upload. The photographed scene is fantastic, with pleasant composition and proper exposure. Great shot on film - although Vanda is right about the noise. Try using Neat Image, it's a free software (at least the demo) to remove noise. Otherwise congratulations for the nice photo.